--> Services lifted the 69th edition of Santosh Trophy after edging out hosts Punjab 5-4 via tie-breaker in a nail-biting final held at Guru Nanak Stadium in Ludhiana on 15 March 2015. --> With this, Services won the Santosh trophy for the fourth time. --> Earlier it had won the trophy in 2013, 2012 and 1961. --> The tournament first began in 1941 and was named after the late Maharaja Sir Manmatha Nath Roy Chowdhary of Santosh, which is now in Bangladesh. --> Young Indian shuttler K. Srikanth clinched the Swiss Grand Prix Gold championship title after overcoming a strong challenge from Viktor Axelson of Denmark in a hard-fought men’s singles final on 15 March 2015. --> The final was held at Basel in Switzerland. --> With this, he became the first Indian men to win the 120000 US dollars Swiss Open Grand Prix Gold. 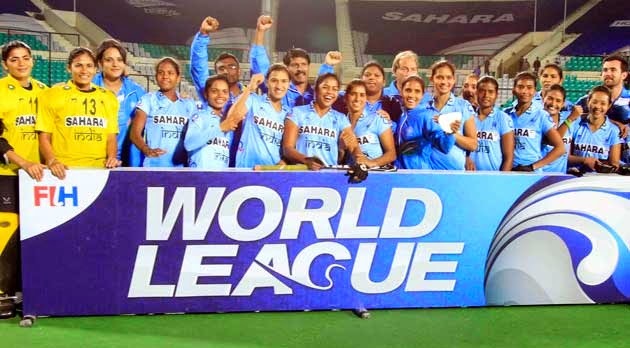 --> India scored in three of the four quarters to outplay Poland 3-1 in the final and clinch the FIH Hockey World League Round 2 at Major Dhyan Chan stadium in New Delhi on 15 March 2015. --> Vandana Kataria (15th minute), Ritu Rani scored two goals (44th and 59th minute) for India which led to victory. --> The World Consumer Rights Day (WCRD) 2015 was observed on 15 March 2015. --> The theme for the WCRD 2015 is Helping consumers choose healthy diets. --> The World Consumer Rights Day (WCRD) is observed on 15 March every year to commemorate the historic address given by the then US President John F Kennedy to the US congress in 1962 in which he outlined the definition of consumer rights for the first time. --> One of the country’s noted Gandhians, Narayan Desai, known for his rendition of Gandhi Katha — stories on the Mahatma’s life — passed away on 15 March 2015. --> He is son of Mahatma Gandhi’s personal secretary and biographer Mahadev Desai. --> In 2004, Desai started a lecture series on Gandhi called ‘Gandhi Katha’, which he took across the world and received much acclaim for it. --> Powerful cyclone Pam on 14 March 2015 hit the south Pacific archipelago of Vanuatu. --> The cyclone Pam, a category five tropical storm, brought destructive 270 kilometre-per-hour winds and torrential rain along with it. --> Vanuatu is located north east of Australia to south west of Hawaii Islands. --> Lewis Hamilton fought off teammate Nico Rosberg to give Mercedes a dominant victory in the season-opening Australian Grand Prix in Melbourne on 15 March 2015. --> Four-time world champion Sebastian Vettel, in his first race drive for Ferrari since switching from Red Bull, finished on the podium in third place just ahead of Felipe Massa in a Williams. --> Hamilton, 30, has won seven of the last eight GPs though this was his first in Australia since 2008. It was Hamilton's 34th win in his 149th GP.